We should add Purdue hasn't scored in last 3:00. Good game for the punters so far though. Based on how much trouble UW is having getting clean looks inside, it's going to need a big game from Koenig. He has 1 shot attempt so far. Points are at a premium today. Boilers come into the game giving up only 66 points per game and Wisconsin 59.4. That's how you snap a scoring drought! Give it to Biggie and he knows how to score though ???? Swanigan scores on a hook one possession, on a long 3 on the next. Purdue up 22-14 with 6:16 left. 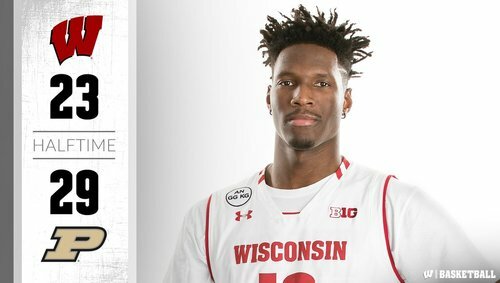 #Badgers take a time after Swanigan buries a three in transition for a 22-14 lead. Badgers 6-21 shooting (28.6%). #Packers have been starting fast, playing from ahead during winning streak. Not today. Have 11 yards total on first two possessions. 5 straight points from Swanigan forces a UW timeout. Hayes checking back in with 2 fouls and UW down 8. Purdue up 8, but it should be more. Boilers have 10 turnovers in 25 possessions. 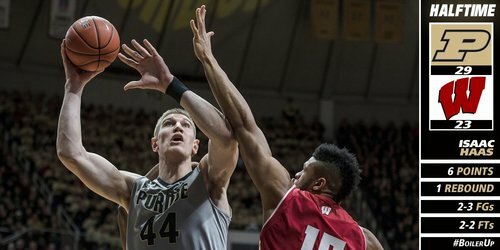 Purdue has committed 10 turnovers but lead by 10 thanks to Wisconsin's stone-cold shooting. #Packers looking for the BIG hit in the passing game. Time to find quicker rhythm throws. NOT a good 1st Q for the offense!! UW shooting 28 percent, down 25-17 with 3:03 left until halftime. #Badgers down 8 and Boilers at the line for bonus. UW 0-6 from 3 and 7-25 overall. Purdue? 3-5 and 9-16. We have 3:03 left in the half Purdue would be up by about 15 if not for 10 turnovers. Careless with ball. Offense: 28% FG shooting, Hayes 5p, 2r; Happ 4p, 2r, 3a, 3s. Defense: Purdue has 10 turnovers. Happ = scores off the transition! #Badgers Happ with steal on one end and lay-in on the other end and UW within 27-21 with 1:28 left. Time Boilers. The #Badgers are hanging in there, down 27-21 with 1:28 left until halftime. Hayes is being more assertive despite playing with 2 fouls. UW down 6, 1:28 to play in first half. Halfime: Purdue 29, #Badgers 23. HALFTIME: No.20 Purdue 29, No.13 Wisconsin 23. 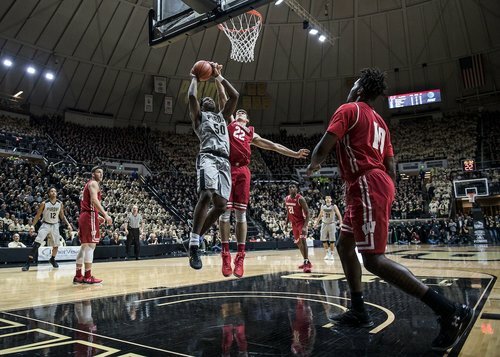 Boilers shoot 52.6 percent but commit 11 turnovers to keep UW close. #Badgers within 6 at half despite being 0-6 from 3 and 10-29 overall. #Giants Shepherd made a GREAT play to prevent a BIG Randall intercption. #Packers get a stop. Let's see if the offense shows up? PPP: Purdue 0.94, #Badgers 0.72. Second-worst half of the season for UW (0.59 in first half vs. North Carolina).